Sweetwater, TN (July 17, 2017) - Bryant Boats recently announced the introduction of an all new Surf Package available on most 2018 Bryant models. 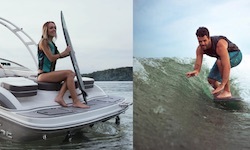 The Surf Package allows surfing enthusiasts the ability to ride an endless wave anywhere without sacrificing the comfort, versatility, and efficiencies of a luxury sterndrive. I saw a Surf Gate on a new 26' Chaparral. I talked to the owner it had a front mount duel prop and a 350 engine. He said it had a great surf wake even without filling ballast. He also said it was loaded and he got a great deal at the boat show 107000,00 instead of the 120000.00 it would have been. Hard to believe a Chaparral would be in the same price as a GS or G21? That's a big boat--bathroom, etc. Not possible to compare the two. It's a totally different market. The previous I/O cruiser brands are just bring there excising customers into the surfing world. Nobody who owns a vdrive is going to go the other way.